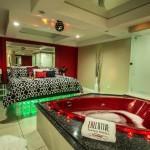 Our Fantasy Suite stays true to its name, bringing even your wildest fantasies to life. Carefully designed and decorated to appeal to all sorts of individuals and couples, this suite is as close to perfection as you will find. Ideal for couples looking to spice things up, or as a way to surprise that special someone in your life. There won’t be a dull moment during your stay in this luxurious suite, equipped with neon lights, dance pools, and signature love chairs. 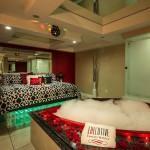 Our transparent glass showers and luxurious king sized beds are sure to set the mood for a romantic evening. Regardless of what your expectations are when you reserve a room with Executive Fantasy Hotels, it is our goal to far surpass them. 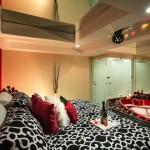 Interested in booking our incredible Fantasy Suite? Click here to send us a message now or to find the contact information for our various locations. *Images used are of the Fantasy Suite found at the Miami Mansion. See rates here.